CONVERSE Skateboarding presents THE ASIA CROWN - The Road to PHILIPPINE SKATE SUMMIT 2012. 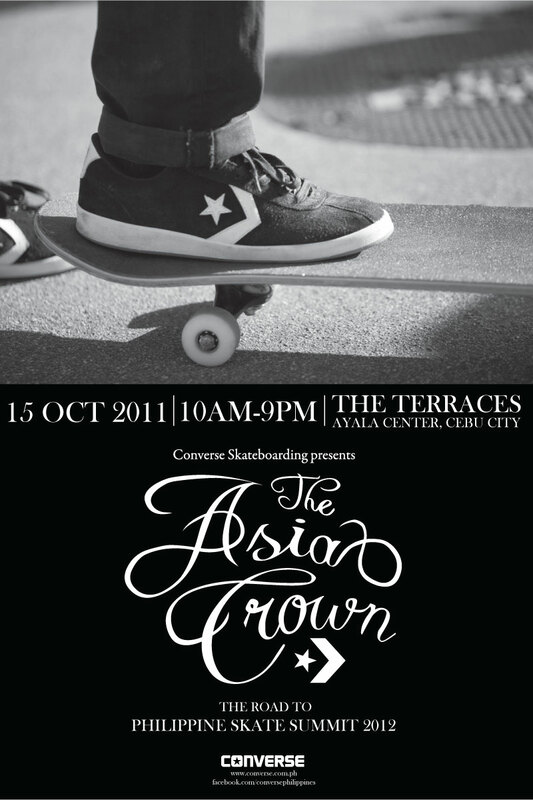 The Asia Crown Kickoff Party will be on October 15, 2011 from 10AM to 9PM at The Terraces, Ayala Center, Cebu City. A brief info for The Asia Crown Skateboarding Competition - Converse is adding a tone of seriousness in skateboarding this time round. This event will unite skaters and showcase board-riding culture in its full glory, as well as provide a spotlight for youth talents in the region. Join us for a daylong affair with great fusion of sports and live music at The Terraces Ayala, 10AM to 9PM. The Asia Crown Skateboarding Competition presented by Converse is a warm-up event for The Philippines Skate Summit 2012. 0 comments: on "Converse Skateboarding The Asia Crown for Philippine Skate Summit 2012"